I love Monterey and Mazda Raceway Leguna Seca. Obviously, I love Porsche. So when I heard that near-as-makes-no-difference all the Porsches in the world were going to be at Leguna Seca in mid-October 2011, I had to be there as well.My darling wife, bless her, was receptive to the idea–and then we heard that Sally Carrera of Pixar’s “Cars” fame was going to be there, too. The kids would adore that. Sold. Now, the only convincing I had left to do was the hardest bit–babe, I don’t want to take the Murano to a huge Porsche event, and I don’t want to take the Barstow/Bakersfield route–I want to take the 911, and I want to see Yosemite National Park. My position on the matter was now raising eyebrows. She doesn’t trust herself to drive stick, so all the driving would be my responsibility. 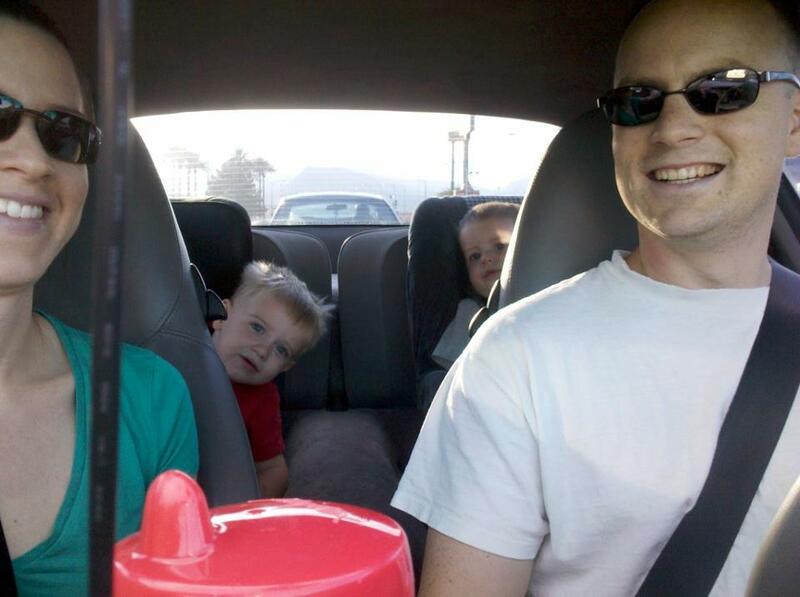 The boys are small, but their car seats are not. How would we all fit? Where would our luggage go? How would we (she, really, since I was driving) entertain them for the entirety of the long drive? Valid concerns, certainly. But I thought I could win her over. It’d just take some effort, planning, and forethought on my part. First off, we definitely weren’t going to make it with two full-size car seats in back. Some time on the Rennlist forums revealed the first breakthrough I would need: the Combi Kobuk Air-Thru child booster seat. I swear some car seat engineer took it upon him- (her? )self to design that thing specifically so it would meet all the safety requirements and standards–AND fit perfectly in the rear seat of a modern Porsche 911. Whomever you are, I am in your debt. There’s a picture from our trial run with the new seat, with child #1 (on picture left) as test pilot. The cable on the left side of the foreground sippy cup (which fits in the 911’s ingenious, space-saving cupholder) is the phone cord which powers the Valentine One radar detector mounted to the windshield. For the trip, we did make a significant change from the template here–we actually ran with #1 behind me, as I needed a little more room to work the pedals than the full-scale car seat would permit. The space problem with car seats is more a longitudinal one than a side-to-side one, as I think most parents would agree. Now, it’s all well and good that the four of us physically fit in the car. But this was to be a 5-day, 4-night excursion, and we’d need to pack some clothes somewhere. I had some experience in this matter, having packed and taken the car on a 3-month TDY before. Porsche lists the under-the-bonnet cargo room as 4.8 cubic feet. I swear it’s the most generous and useful 4.8 cubic feet I’ve ever encountered. I found we owned a rolling duffel bag that fit in there perfectly, maximizing the space but still leaving room on top for one or two small items if needed. The other key spot for packing a 911 is the parcel shelf underneath the rear glass. I eyed the space, then grabbed the original box for my 23″ flatscreen monitor, pulled all the styrofoam molding out, and voila! Perfect parcel-shelf luggage. Other key space would be in the rear-seat footwells (since neither boy’s feet would touch the floor), glovebox, and the map pockets in both doors. Lastly, we’d need to keep the boys happy on the trip, and that would require some route planning. I spent around two or three hours going back and forth between Google Maps and Google Earth, scouring the route for parks and places for the kids to run around. My goal was to try and find an entertaining stop after each two-hour leg of the journey. This wasn’t entirely possible, as large parts of our expedition were (admittedly by design) completely unpopulated and undeveloped. Still, it was good to know where we’d have to push through and where we could expect a break. I presented my better half with the results of my planning, and after some cajoling (caaammmmmm annnnnnn), she relented. In fact, she seemed excited about breaking the kids-require-an-SUV-or-minivan mold. I certainly married the right girl! On Thursday, October 13, at 9:00AM local time, we set off. Part II – The Journey…coming soon! So that's where my rolling duffle bag went!